As the end of May quickly approaches, I’m thinking about summer vacation possibilities. Feeling landlocked in the middle of Texas, I can’t help but dream about beaches, coastal waters and big waves. 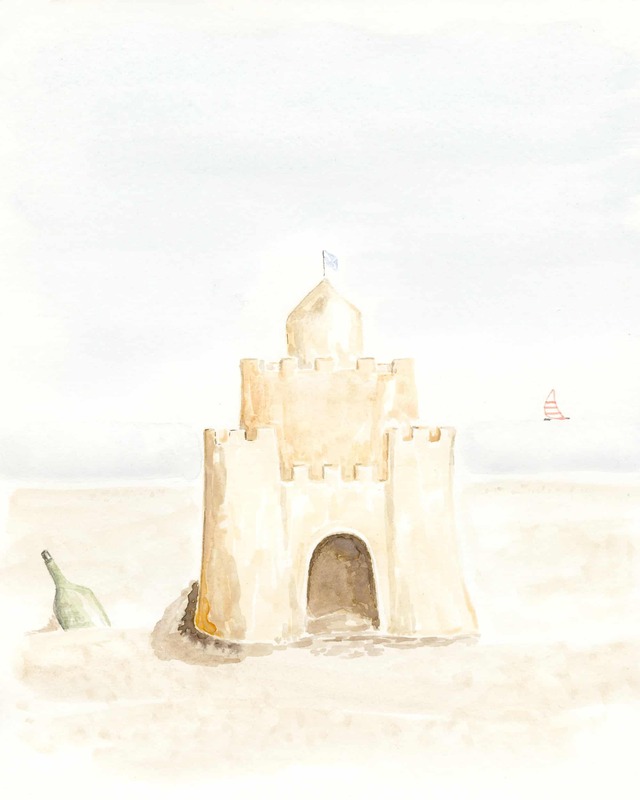 Yesterday, I painted a watercolor of a sandcastle, hoping that my travels this summer might take me to a beach. I can go south, east or west. I’m not picky! Last summer my adventures were in Scotland and the Isle of Sky with my daughter Andrea, where we explored some fantastic castle ruins. Thinking about that trip, I decided to add a wee flag of Scotland on the center tower of the sandcastle just for fun. I have two printables to share with you. One with “sun, sun, sun, here it comes”, and the other as originally painted. Nothing like a Beatles song to get those happy vibes going. Remember the free printables are for your personal use and enjoyment only. Click to download the free printable. Hope you have a wonderful weekend. Thank you so much for stopping by! Any suggestions on beach vacations? I’m all ears!